River Rock Grill & Ale House offers a Northwest dining experience in Renton, WA. The restaurant offers breakfast, lunch and dinner, along with special events seasonally. You will find great dining as well as a club bar in the restaurant at Maplewood Golf Course. River Rock Grill & Ale House provides professional staff and a relaxing environment. For breakfast, you can enjoy a continental breakfast, biscuits and gravy, bacon quesadilla or others. Lunch at River Rock Grill & Ale House offers you Jose's taco salad, beer battered fish and chips, the Maplewood club or River Rock choice. The bar has offerings including bottled and draft beer as well as wine and mixed drinks. Join Us For Mother's Day Brunch. 9 a.m. - 2 p.m. Bring your mom and the rest of the family in to enjoy our grand seafood station, meat carving station and a wide assortment of brunch favorites and more..
Join Us For Easter Brunch. 10a.m. - 2:30 p.m. Bring your family and friends in to enjoy our grand seafood station, meat carving station and a wide assortment of brunch favorites and more..
We all had a very enjoyable evening. Service was very good and the food was delicious. Great food in a casual friendly restaurant. Out waitress was awesome! Food, music and drinks were great. Hope to go back soon! Very polite staff and very well prepared food I would definitely come here again! Our service was excellent. Food just kind of mediocre with salad greens not crisp (Cobb) and the chicken on it was "yesterday's", and the French onion soup just nothing special (per two in our group who had it). They were out of the apple bread pudding :( so we tried the lava-flow chocolate dessert (warm) which was excellent. Also tried a piece of the chocolate cake, which was dry. Ambiance very nice, and pretty quiet at 1pm on a weekday so it made for enjoyable conversation. Will we try again . . . perhaps, but not overly likely. Made a reservation 2 weeks in advance.. they did NOT have our reservation on record. We got a very nice, sweet young server. But she really lacked training. Two of the 5 entrees she brought were the wrong thing... she did not give us separate checks as we had asked and a couple other things. She was very sweet, just has a lot to learn. Love the food here, great place for lunch or dinner. Great for breakfast. Two eggs, sausages and ranch potatoes were perfectly cooked and the best value. Dinner prime ribs were very good and cooked to order for four of us. Have had many prime rib dinners here and have been very satisfied- very consistent. Very good wait staff service. Our family has dined at River Rock Grill & Ale House for a number of years now. We love their tasty assortment of reasonably priced menu items, & the consistent service. Diet restrictions & special requests are graciously accommodated, upon request. This restaurant is a local gem! Clean & comfortable with a warm ambiance. Decor is updated to match the seasons. This restaurant allows for everything from casual impromptu dining out, to special formal occasions. Conveniently located along Maple Valley Highway at the Maple Valley Golf Course. It’s a great spot for romantic dining, special family gatherings, business endeavors, or fun dining out to catch up with friends. Had the Prime rib dinner everything was cooked nicely with that being said took my Mom with me to dinner she had the chicken special which was a chicken breast stuffed with prosciutto and cheese did not care for it at all. I believe it was the Gouda cheese my recommendations would be us to switch that out with Swiss cheese for more enjoyable dinner everybody likes Swiss cheese. Dinner was good prime rib was over cooked soup was warm should be hot. Dinner was good. Soup was warm. Note soup should be served HOT. Dinner was good as always. Service was a bit slow even though there weren’t many in the restaurant. started with the soup it was warm ? should be HOT Had the prime rib, it was over cooked. It would appear to me the restaurant has raised prices again and on top of raising prices again I was overcharged for my dinner the menu said $25 and I was charged $28. Dinner was good my lady friend had a New York steak cooked perfectly I had the pasta special which was shrimp in an Alfredo sauce over fettuccine dinner was delicious would recommend. Great customer service - HIGHLY RECOMMEND. Went there for Sunday breakfast with a friend to "catch up" and be able to have authentic food and talk to each other. The summer day was beautiful and so was the meal. Thanks again!! Service was very slow!! Dinner was good but the cook was not accommodating. For a quiet atmosphere, the indoor dining is just the right place for a date, or a group. If you’re looking for more energy, the outdoor dining is perfect on a sunny day. Live music on select evenings add to the great outdoors without being to loud. The food is great and the service is wonderful. Great restaurant in every respect. We dined outside near a "babbling" fountain - five in our group. The service was prompt, helpful, informative and courteous and the food was delicious. Try fresh shrimps in grits sometime - fantastic! Food was great! Service was a bit slow. We had dinner here after our long flight. 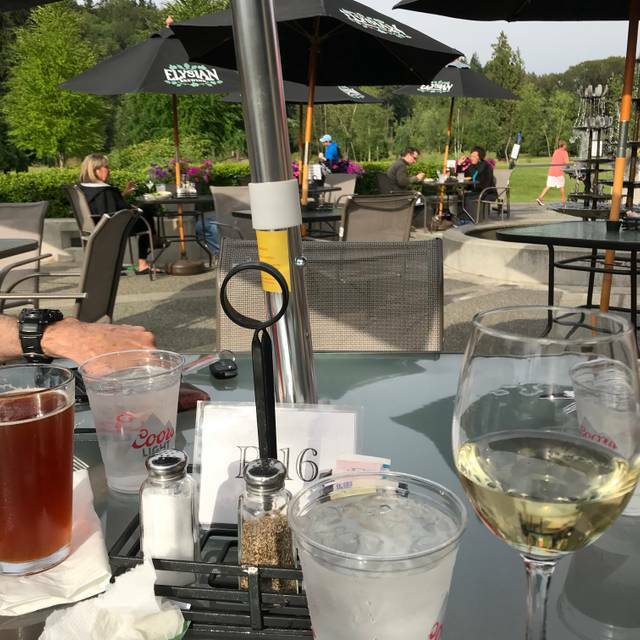 It was so lovely and relaxing to dine on the patio and watch the golfers tee off. It was a perfect start to our vacation! Prime rib dinner was very good with that said soup was cold and the service was horrible. Dinner was good service was good. Had not been here in ages. Thought the quality of foods had improved (at least) Food was awful!!! Not worth paying the price. Will never come back! Had the NY Steak one again it was under cooked all most raw. You need to get a new cook that knows how to cook steak cuz the one you have can’t. Great food and ambience. Although pricey, would return on special occasions.